I have always been a tea drinker. I have fond memories of visiting my grandmother when I was little and in the evenings, we’d have hot tea and cream cheese crackers. My favorite is black tea, but I also like decaffeinated teas, especially when I’m not feeling well. It’s a good thing that I was sent some Choice Organic Teas as I’m sick this week and there’s nothing more comforting than a cup of hot tea and a cozy blanket. I was sent two boxes of tea from Choice Organic Teas and have been enjoying them both quite a bit. Before I tell you about the specific teas, let me tell you a little about the company. Choice Organic Teas is a brand of Granum, Inc. of Seattle, WA, and is North America’s number one selling exclusively certified organic tea line. The company is not only dedicated to using organics, but is also committed to its employees who cultivate the tea. In 2000, Choice Organic Teas became the first tea crafter in the United States to offer Fair Trade Certified™ tea. Today, they proudly offer more varieties of Fair Trade Certified tea than any other tea company in North America. Choice Organic Teas are manufactured in a certified organic facility where Green-e Certified renewable energy certificates (RECs) from wind power are purchased to offset 100 percent of the facility’s electricity. Earl Grey Lavender – this elegant tea puts a little twist on the traditional with this classic organic black full-bodied tea getting a hint of English Lavender infused into it. The tea is also blended with bergamot, which is an Italian citrus, to give it a little zing. I really enjoy drinking this tea and I think it would taste great iced as well, especially when the weather heats up. Breathing Space Tea – this Wellness Tea provides a refreshing blend of Echinacea, one of the most popular immunity-supporting herbs and elderflower, trusted by herbalists to support healthy sinuses, ears, and throats. The tea also contains Eucalyptus, known for thousands of years to help support normal respiratory function for healthy breathing. I’ve been drinking this tea all week since I’m feeling under the weather and love its bright, minty taste. I’m definitely planning to pop a few of these tea bags into my laptop bag to ensure I have them when I’m in the office. 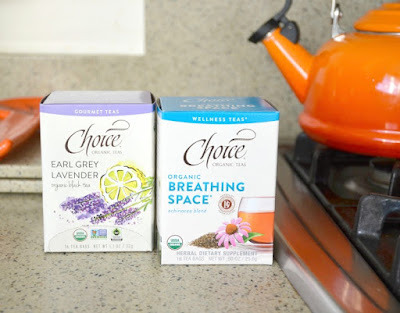 Both of these teas come in a box that contains 16 individually wrapped tea bags and are available on the Choice Organic Tea website for $5.39 each. Check out the website to shop their entire line of products, which includes everything from white tea to herbal tea as well as loose leaf and pyramid teas. Disclosure: Kristine Snyder received complimentary samples of the products mentioned in this review. No monetary compensation was received. Regardless of receiving samples, Kristine's opinions, thoughts and words are her own 100% unbiased opinion on the products. Your thoughts may differ. I am sorry that you are feeling sick and hope you will feel better soon. I too am a tea drinker. I am not a big fan of bergamot, but I do like lavendar. The Breathing Space Tea sounds delightful to me. I am glad that this company is eco-friendly.